Vistas in Botany features the study of life histories of plants, their development from spore or seed through vegetative phases up to the diverse phenomena of reproduction needs. 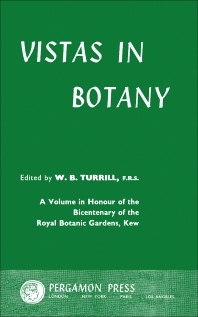 This book is a compilation of studies and research conducted by several botanists that discuss topics such as the taxonomy general principles and Angiosperms; plant biochemistry; causal plant ecology; plant geography; cytology; genes, chromosomes, and evolution; viruses; bacteria; fungi; Bryophyta; Pteridophyta; Gymnospermae; and plant physiology. This publication is valuable to botanical specialists who wish to obtain updated knowledge in botany or phytology, and to students conducting research on the science of plant life.